President Obama links infrastructural improvements to business retention, specifically, that unless American start to improve the country’s infrastructure, which will require Congress to discontinue divisive austerity-politics, or else we will continue to lose businesses abroad as they pursue higher-quality infrastructure for their business needs. Perhaps this is a pathway that will result in some of the changes that are much needed. Whether this linkage is true or not (i.e., whether infrastructural improvement is linked meaningfully to business retention) is essentially unimportant; whether it results in actual political or economic change seems to be the only operant quality of concern given that truth in politics seems at most a tertiary concern for a generation of politicians. 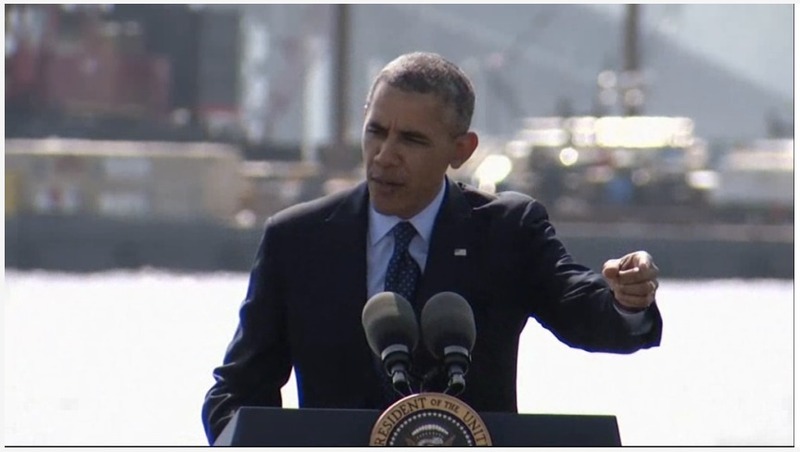 Appropriately, Obama gives the speech near The Governor Malcolm Wilson Tappan Zee Bridge, the crumbling cantilever bridge spanning the Hudson River at one of its widest points. This entry was posted in Decay, Disaster, Government, Infrastructures in the making, International, Pragmatism, Uncategorized by Nicholas. Bookmark the permalink. “The loan has run into opposition from the state’s environmental groups, who argue the state is misusing the funds.” … is precisely the sort of issue we need to obviate, but, alas, short-circuiting the loan for the project seems all but inevitable. Still, I’ll be curious if the more general theme has only staying power. Possibly it does not, or maybe it does. We will see, although the 8-ball rarely lies. i don’t doubt that the democrats will keep repeating it but as with say pointing out to republicans that it is cheaper to invest in giving kids a headstart in school (along with healthcare and nutrition) and helping them to finish highschool than to imprison them it will likely be demonized by the right as more big govt interference/spending/etc. Well, borrowing the money from a clean water fund to produce a new bridge is not exactly the smartest political move despite the fact that a new bridge could help to mitigate some water issues. However, the scope of the improvement does not need to cost so much to get the same results for water quality. That seems like a bad move. Also, to the extent that Democrats are being fought by environmentalists … oh, this smacks of the same sort of lagubrious state of affairs between the republicans and tea partiers. yes was thinking of the broader plea by the President to invest in building our common futures.